The vase is an amphora, a type of two-handled storage vessel. It was originally intended for storing wine or oil. 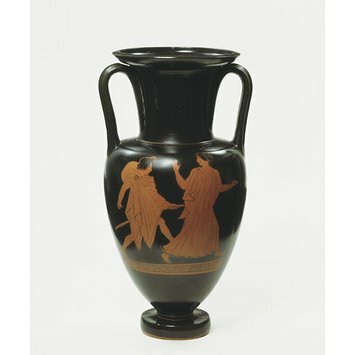 Greek vases like this were greatly admired in late-18th-century Britain, where they were often displayed in private libraries and in galleries specially designed to house antiquities. 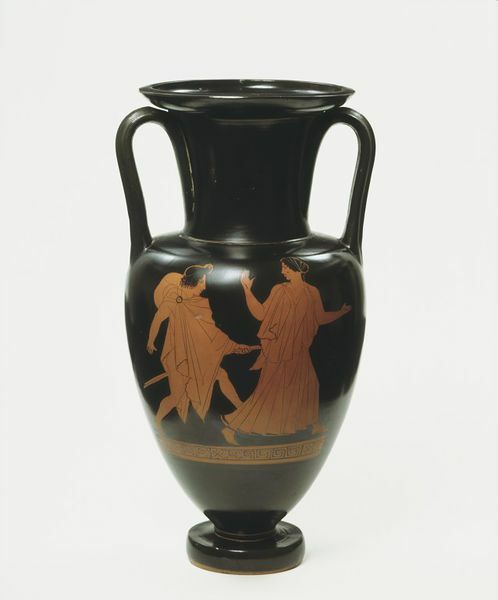 The Staffordshire potter Josiah Wedgwood (1730-1795) made imitations of Greek vases like this one in 'encaustic'-painted Black Basalt stoneware. The vase is decorated in the 'red figure' technique, in which the areas surrounding the figures are painted in a slip (mixture of clay and water), leaving the red pottery showing through. Careful control of the firing process allowed Greek potters to oxidise the body of the pot, turning it red, by keeping the kiln well ventilated. The kiln was then starved of oxygen and filled with carbon monoxide (by using wet fuel), causing the slip to turn black. The kiln was then again well ventilated. The fresh oxygen supply turned the pottery back to red. The firing was stopped before the slip turned red once again.